A component of the Resilient Shorelines study set out to determine if the earthquake effects had altered the location and pattern of sites utilised by īnanga (Galaxias maculatus) for spawning, which are typically restricted to very specific locations in upper estuarine areas near the freshwater-saltwater interface. As such, īnanga spawning sites are potentially a very good indicator of change, and conversely, īnanga may be especially vulnerable to changes that affect the availability or condition of suitable sites. And the answer is - yes, there were some major changes! In general, findings from the first year of research confirmed our hypotheses but also indicated there was a lot more work to be done to better understand the causes and consequences of this change. We are grateful to the IPENZ Rivers Group for supporting the production of a joint WCFM / MERG report to document some of the initials findings on earthquake effects with the main audience being waterway management in Christchurch. This information is especially relevant in the context of post-quake recovery which is an ongoing process with many decisions and opportunities yet to be fully explored. 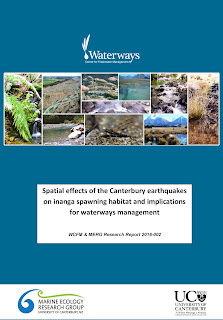 The report "Spatial effects of the Canterbury earthquakes on īnanga spawning habitat and implications for waterways management" provides comprehensive information on changes in relation to the Canterbury earthquakes, and a summary of the key implications for waterways management. 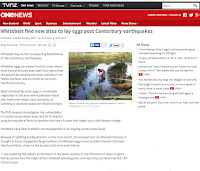 The Canterbury earthquakes resulted in numerous changes to the waterways of Ōtautahi Christchurch. These included bank destabilisation, liquefaction effects, changes in bed levels, and associated effects on flow regimes and inundation levels. This study set out to determine if these effects had altered the location and pattern of sites utilised by īnanga (Galaxias maculatus) for spawning, which are typically restricted to very specific locations in upper estuarine areas. Major changes include the finding of many new spawning sites in the Heathcote/Ōpāwaho catchment. Sites now occur up to 1.5 km further downstream than the previously reported limit and include the first records of spawning below the Woolston Cut. 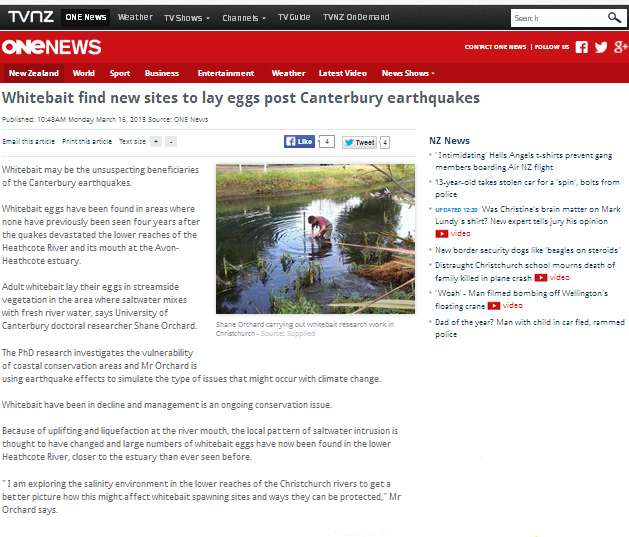 Spawning sites in the Avon/Ōtākaro catchment also occur in new locations. In the mainstem, sites now occur both upstream and downstream of all previously reported locations. 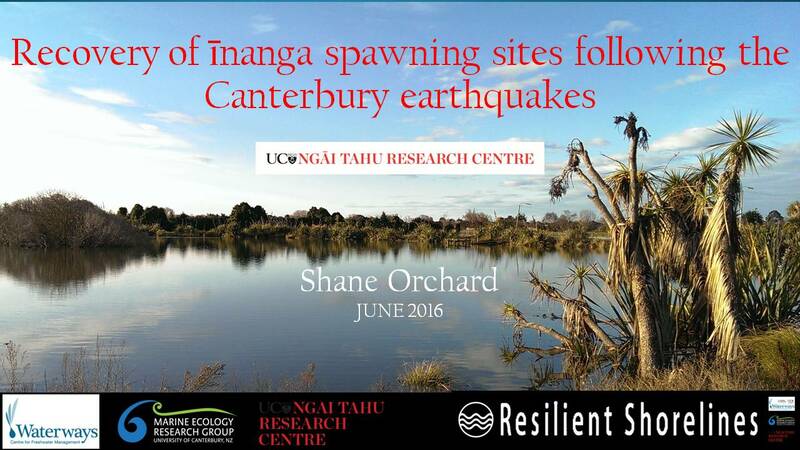 A concentrated area of spawning was identified in Lake Kate Sheppard at a distinctly different location versus pre-quake records, and no spawning was found on the western shores. Spawning was also recorded for the first time in Anzac Creek, a nearby waterway connected to Lake Kate Sheppard via a series of culverts. Overall the results indicate that spawning is taking place in different locations from the pre-quake pattern. Although egg survival was not measured in this study, sites in new locations may be vulnerable to current or future land-use activities that are incompatible with spawning success. Consequently, there are considerable management implications associated with this spatial shift, primarily relating to riparian management. In particular, there is a need to control threats to spawning sites and achieve protection for the areas involved. This is required under the New Zealand Coastal Policy Statement 2010 and is a prominent objective in a range of other policies and plans. We thank the IPENZ Rivers Group and Ngāi Tahu Research Centre for supporting the production of this report. Report available as a free download here. 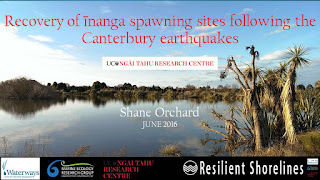 Thanks to the Ngāi Tahu Research Centre and UC audiovisual unit the recent seminar was videoed. Follow the link to the video here.